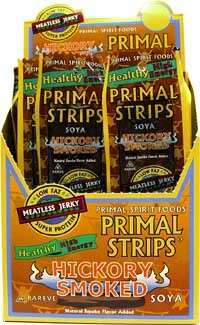 If we were vegan food critics, we'd have to give this incredible new jerky a four star rating! These moist, chewy strips come in 6 unique and delicious flavors- Hickory Smoked Soy, Hot & Spicy Shitake Mushroom, Teriyaki Seitan, Texas Barbecue Soy, Thai Peanut Seitan, and Mesquite Lime Seitan (believe us- they are as good as they sound!) High in protein and low in fat and calories, these are perfect no-guilt vegan snacks. You'll be hooked after one bite! Kosher. Each 1 oz strip is $1.29, or save 10% when you buy in case quantity of 24 or more (mix & match any flavors) for only $1.16 each! Hickory Smoked Soy: Non-GMO soy protein, water, naturally brewed soy sauce, expeller pressed canola oil, licorice root, unrefined cane juice, yeast, sea salt, natural smoke flavor, natural vegetarian spices. Teriyaki Seitan: Non-GMO vital wheat gluten, water, naturally brewed soy sauce, expeller pressed canola oil, licorice root, unrefined cane juice, yeast, sea salt, natural vegetarian spices. Hot & Spicy Shiitake: Shiitake mushrooms, water, naturally brewed soy sauce, expeller pressed canola oil, licorice root, non-GMO vital wheat gluten, seaweed extract, unrefined cane juice, non-GMO soy protein, sea salt, natural vegetarian spices. From Chantel of Northville, New York on 6/4/2018 . The only one I'm not fond of is the Mesquite Lime, and that's the one I've always wanted to like so badly. Unfortunately, the lime flavor is turned into a flavor that's reminiscent of vomit in my mouth :( but all of the rest of them are amazing! and they're great easy-to-grab/on-the-go snacks if you're in a rush or only have a minute to eat something. From Barbara of Exmore, Virginia on 5/26/2016 . The Hickory Smoked jerky is GREAT! This is the first time I’ve tried one. I could eat them all day! It’s been years since I’ve had a regular beef jerky, I used to love them, tough and chewy. The vegan jerky is tough and meaty and it’s wet (not dry like the beef jerky) which I don’t like so much but it’s ok. And 0% cholesterol. I haven’t tried the other flavors yet. I will be buying lots more! I was skeptical but boy am I glad I tried these. I purchased the Teriyaki and Hickory stops and I have to say that they are better than real meat jerkey!! I will be keeping these in my snack cabinet! From VegHead of Orem, Utah on 10/20/2015 . I freaking love these things (I've started buying them by the case). My personal favorite is Hickory Smoked. From Lauren Andalora of Salt Lake City, Utah on 5/26/2015 . These seriously have the exact texture of quality jerky..the taste is 99.5% there too. I got the Texas BBQ. I really think if I hadn't known I wouldn't have been able to tell. Wow! I'm gonna give these to non-vegans.